Most valuables should be placed in bank safe, but we also need wall safe in our house. If we want to put wall safe in our house, we may often find the standard vault types that are commonly sold by manufacturers. However, we should realize that burglars can be quite resourceful in their attempt to break through the wall safe. They may use welding tools, drills and even mini explosives. Having a wall safe as huge as our refrigerator doesn’t guarantee that it will be properly secured against thefts. It is better to have a small wall safe that can be hidden in unexpected places. Huge wall painting and other objects are common places to hide wall safe. Kitchen and laundry rooms can be unusual places to put wall safe. The safe can be hidden behind removable cabinet. Some burglars may don’t bother checking behind the standard paper calendar. Some homeowners actually put their wall safe on the floor and hide it under the carpet. We may also ask carpenters to create wooden paneling that makes the door of the safe to look similar to the rest of panel. It means that it would be very lucky for burglars to find the safe that can be found in any place of the wall. In this case, it may not be a good idea to choose a behemoth that is difficult to hide, unless we need to keep many stuff and the house is continuously occupied even during holidays. If everyone inside the house is planning to have a vacation, it is better to keep the content of the safe in a bank. Whatever model of wall safe we choose, we should make sure that it’s adequate enough to keep our stuff. 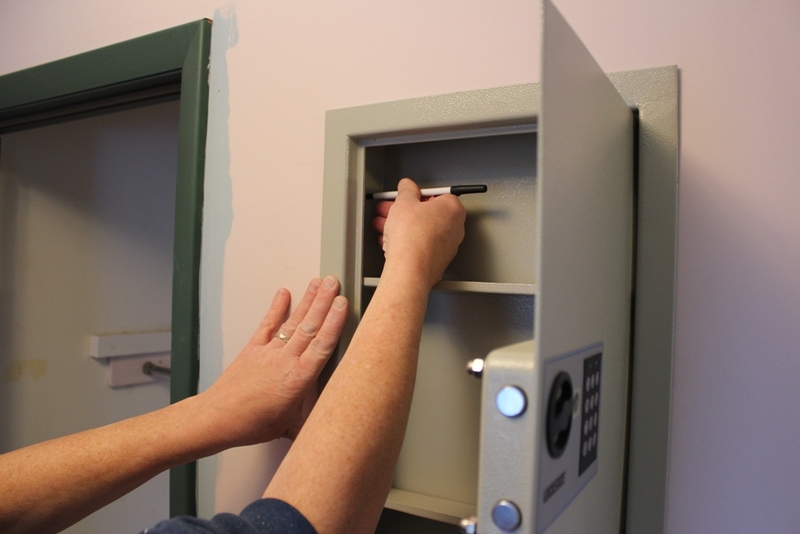 Even if the wall safe is protected with various safety mechanisms, burglars could simply use drills and small explosives to remove a small wall safe and bring it with them. In this case, we should make sure that the safe can’t be easily removed from the wall. The safe could be secured against the wall structure and it should be explosion proof. Brittle wall may not be appropriate for accommodating a safe and it is recommended to choose hard concrete wall that require much effort to chisel away with both drill and explosive. We should make sure that the wall safe can bond properly with the wall safe. We could use hardened pins or gauges of steel that need to be released during attempts of burglary. Obviously, wall safe with extra options would cost more than the standard ones. However, we will be rest easier knowing that our belongings will be properly protected even during a worst-case scenario. There are different brands of wall safe that we can choose and some manufacturers are known for their vetted reputation. It is also a good idea to combine wall safe with other security measures. A CCTV camera and motion sensor in the room can be activated during likely times of burglary, such as at night or when the whole family leaves the house for work or school.